It’s early 1945 and a group of people trek across East Prussia, bound together by their desperation to reach the ship that can take them away from the war-ravaged land. Four young people, each haunted by their own dark secret, narrate their unforgettable stories. 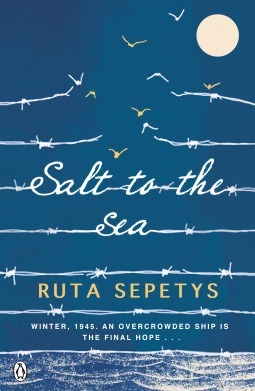 Fans of The Book Thief or Helen Dunmore’s The Siege will be totally absorbed. I read this book about a sinking ship, whilst on a ship… whose wise idea was that?! So anyone who knows me, knows that I love anything set during the second world war. I don’t know why, but there is just something about that time period that just grabs my attention. I was sure that I was going to love this. Only, I didn’t love it. Don’t get me wrong, I liked it, I just didn’t love it as much as I had expected. I have really high expectations for books set in this time period, after my favourite book, The Book Thief blew me away, and then All The Light We Cannot see followed suit. I don’t particularly know why, but perhaps it was due to the fact that I didn’t feel connected to any of these characters for about half of the book. The story follows four main perspectives, all of which are keeping a dark secret. When I found out these secrets, I felt like for the most part, they weren’t big enough to have much significance, and so where I spent a lot of time focusing on these secrets, I lost a lot of the parts which would have made me grow fond of these characters. The actual writing and telling of the story was beautiful. I felt like I could picture every moment, and still now, after a month since reading it, I can recall specific images in my mind. The turmoil and destruction, and sheer desperation of these people seeking to flee was depicted devastatingly well. The ending was a bit cryptic in my opinion. I’m still not 100% sure on some of the details of how events following the disaster played out, or even who the letter at the end is written by. I feel like I would have to re-read it to grasp it. Would I recommend this book? Yes. I think it’s a beautifully told account of events well worthy of it’s Carnegie nomination.